The Mutton Snapper, a member of the Lutjanidae family, is as fun to catch as it is to eat. 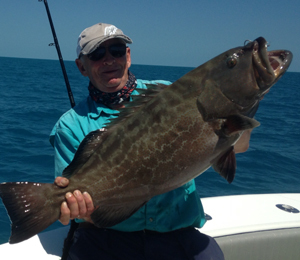 This fish is popular among light anglers looking for a challenge; Mutton Snappers are definitely fighters so they will not be taken in easily. The Mutton Snapper can be found up and down the East Coast and in the Bahamas. 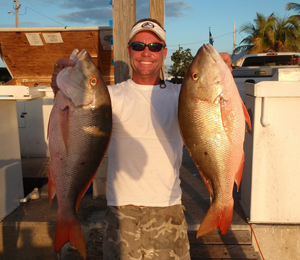 However, the largest specimens are typically found in Key West; in fact, the heaviest Mutton Snapper ever caught (30 lb. 4 oz.) was caught in Key West. Most specimens are not that large, usually weighing in at about 15 pounds. Mutton Snappers are bottom feeders. They feed at a depth of about 50 feet during the day, but when the light is not as good they feed in the shallows. They have olive green on their backs, a blue line just below the level of the eye that extends the length of their body, and a black spot just under the dorsal fin. The lower fins are somewhat reddish in color. One of the things that makes these fish unique is the spawn. In May, June, July and sometimes August hundreds of Muttons gather to spawn in shallow reefs. 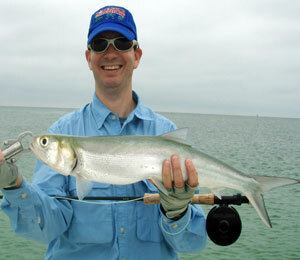 Consequently, this is an excellent time for enthusiastic anglers to plan a Key West fishing trip. Fishermen are somewhat divided over the best way to catch a Mutton Snapper. For example, some say live bait is best, some say artificial and still others say that only dead bait is acceptable to these fish. In the end, all three methods are effective so which bait to use becomes a matter of personal preference. 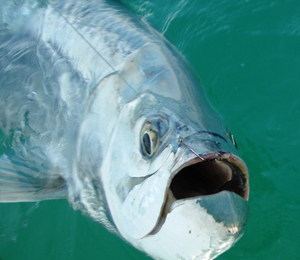 Amid all the uncertainty, there are a few things that all or most fishermen agree to. First of all, the bait should look very natural. In other words, leave it on the bottom of the ocean and don't jig it up and down. Also, patience is key. Finally, look for small groups of less than five Mutton Snappers; they will not be in a large school unless the spawn is going on.